Designed by a yoga-loving couple, who also loves Oregon and trees, the Yoga Farm is the perfect refuge for a cozy, autumn get away. The property is surrounded by endless forest and a calming river in Vernonia, Oregon, which is about ninety minutes to two hours from Salem – depending on your choice of scenic or more scenic drive. The entire farm house and property will be ours for the weekend, providing lots of space to wander and explore, and plenty of time away. Lodging will be spread out across the property in several cabins and meals will be served together in the main farm house. An Oregon yoga and SUP yoga teacher and creator of Yoga + Beer pairings, Mikki Trowbridge aspires to both inform and inspire through her teachings. She is known for her anatomically informed and soulfully inspired yoga classes that promise to be a little nerdy, but always fun, flowing and accompanied by phenomenal playlists. Her style creates space for yogis to be challenged and to grow their practice, but also to find ease, confidence, laughter and yogi friends. In addition to teaching yoga, Mikki also enjoys volunteering and inspiring others to find their passion for service, traveling, sipping on craft beers and getting outdoors for a hike, a paddle or to catch a sunset. An Oregon School of Massage graduate, Diane Davidson, LMT has enjoyed a thriving practice in Salem Oregon since 2010. She incorporates her understanding of anatomy, a vast variety of massage techniques (including deep tissue, myofascial release, shiatsu, cupping and gua sha) and her yoga training to provide her clients with the opportunity for a successful session. With eight years of yoga teaching experience, and a dedicated student for over eleven, Diane approaches massage as a body, mind and spirit journey. The intention she holds for her clients is to be in constant communication (verbally and/or non-verbally) to create the environment to connect and learn on a deeper level about ones own self though the healing process. Utilizing education and experience she provides an individual treatment plan based upon her clients needs to achieve complete wellness for the whole person. Learn more about Diane. michael is a yoga teacher and sound therapist from Salem OR. Inspired by his own practice michael brings creativity and intuition together with anatomical focus and alignment reminders. michael encourages others to intelligently explore their bodies, practice and potential. He often instructs long holds, giving time to explore the many details of a posture. In addition to movement michael has a love for sound. He has joined his passions by sharing healing instruments with his teaching. Sharing from a collection of instruments including didgeridoo, large gongs, singing blows, native flute, hand drums and Hang michael creates unique soundscapes. As a certified Holistic Nutritionist, and farm-to-table enthusiast, Kristie uses her passion for food and community to cultivate memorable experiences. She grew up on a berry farm with five younger siblings, and developed a deep love for creating beautiful and nourishing meals for her loved ones at an early age. The garden is her happy place, and you can find her in the kitchen daily, with a focus on self procured products, and seasonal ingredients. Kristie also finds joy in just about anything outdoors, loves hosting events for her friends and family while sipping a glass of NW red wine, and spending time with animals of all kinds. Her goal is to educate those around her on the importance of choosing wholesome foods to put into our bodies, while also making both preparation and production a stress-free and enjoyable experience for everyone. 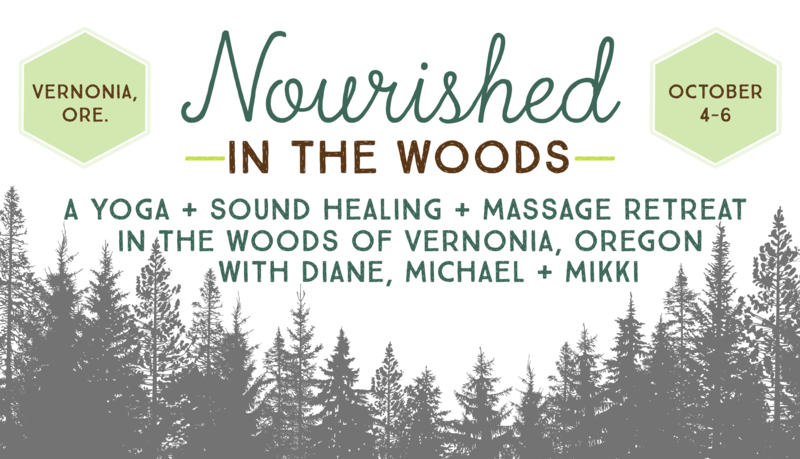 We only have 16 spots available for this retreat! To claim your spot, submit your $250 non-refundable deposit at the link below. Your remaining balance will be due before September 1st. Paying for a yoga retreat should not be stressful, so we’ll work with you on payment plans and spacing out the financial commitment of this weekend.